I love erosion. One of my favorite places to see erosion is Utah. When I travel to Kanab, I stay at the Red Cliff Retreat. Its quiet, relaxing and centrally located to the best erosion in the world; Bryce Canyon, Zion, Grand Canyon, Escalante to name a few places. I give it 5 stars. 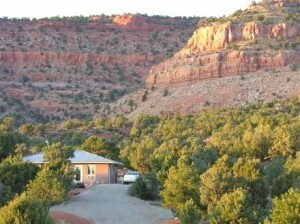 Red Cliff Retreat, the best place to stay in southern Utah if you like erosion.